A new World Internet Project report (pdf, 2MB) released today by AUT concludes that many New Zealanders continue to be digitally disadvantaged. The Executive Director of the World Internet Project in New Zealand, Dr Philippa Smith, says that the report shows the digital divide still persists. She commented that age and household income are still the biggest barriers to internet usage. At a lunchtime presentation in Wellington she also pointed out the largest non-user group are Pasifika. 22% of Pasifika respondents indicated they have never used the internet, or have stopped using it. This contrasts strongly with the 2% Asians, 9% New Zealand Europeans and 15% Maori in this category. The report also revealed that 18% of low income families (with an annual income of less than $35,000) are also in this category of “non-user”. “Non-users” rise to 47% for older low-income families. This presents an ongoing challenge for New Zealand, as our society becomes increasingly dependent on digital technologies. On one level, New Zealand is leading the world in terms of broadband internet connectivity, thanks largely to the huge investment by Government and telco providers in ultrafast broadband fibre in urban areas and wireless connectivity in rural communities. According to the AUT report, only 13% of non-users don’t use the internet because they don’t have an internet connection. A much large percentage (34%) say it is because they are “not interested” or don’t find the internet “useful”. 20% say it because they don’t know how and 18% because they don’t have a computer. The 2020 Trust’s focus on “digital inclusion” recognises that the digital divide is as much about skills and motivation as it is about connectivity. The Trust’s mission is to address these challenges raised in the AUT report, by focusing on the people capability issues through programmes such as Computers in Homes, Stepping UP and KiwiSkills. The Trust welcomes the publication of this informative new report as it helps to keep the spotlight on “digitally at-risk” groups. Targeted national and local policies can then be developed to ensure equitable access and participation in our expanding digital economy. 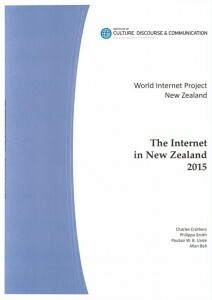 Read AUT article: World Internet Project: latest NZ findings show greatest online privacy concerns focused on corporates not government which summarises highlights of the report and comments on it.